This chapter is a synthesis of new knowledge, procedures, best practices and references for collecting plant diversity since the publication of the 1995 volume Collecting Plant Genetic Diversity: Technical Guidelines, edited by Luigi Guarino, V. Ramanatha Rao and Robert Reid, and published by CAB International on behalf of the International Plant Genetic Resources Institute (IPGRI) (now Bioversity International), the Food and Agriculture Organization of the United Nations (FAO), the World Conservation Union (IUCN) and the United Nations Environment Programme (UNEP). The original text for Chapter 10: Published Sources of Information on Wild Plant Species, authored by H. D. V. Prendergast, has been made available online courtesy of CABI. The 2011 update of the Technical Guidelines, edited by L. Guarino, V. Ramanatha Rao and E. Goldberg, has been made available courtesy of Bioversity International. Chapter 10 of the 1995 edition of the Technical Guidelines provided key works and extensive lists of references useful to collectors for locating and recognizing the plants they would go out to collect. The methodology provided in 1995 suggested using the information provided as a guide to more specific publications. This approach to obtaining published information has changed with the advent of the internet, which has become a fast and primary means of locating and accessing relevant resources. Many of the key works listed in 1995 have kept pace with the development of information technology and have become available online. This revision of chapter 10 provides an update of key works and floras, including their online availability, as well as links to other relevant resources. It focused on printed literature and described a methodology that should lead to relevant and necessary resources for researchers planning to collect wild species. The methodology started with some key works, considered “essential to every collector and which act as „signposts‟ to the rest of the relevant botanical literature”, and was supported by listing large-scale floristic, ecological and bibliographic works. The collector was supposed to identify from these basic publications other more specific and focused literature. In order to reduce the literature to a manageable but effective minimum, only major works were included in the lists, and publications referring to just one country or one group of plants were excluded. They should be easily located via the key works listed. Today the quantity of published resources as further increased, but given the advent of the internet, it has become much easier and faster to locate resources. Any reference to publications specific to a country or plant group, or the publication itself, can today be retrieved through a targeted internet search. The right combination of search terms typed into the search box of an internet browser can immediately yield important information. A methodology to retrieve published information on wild species today would therefore include the internet as an essential resource: any search would most likely start with a search on the internet. Publications that would need to be acquired in hard copy can easily be ordered through online bookshops, so the list of international book sellers has not been updated for this revised version of chapter 10. The key works provided by Prendergast in the 1995 chapter, however, have not lost their importance. Some have been updated, and in many cases their accessibility and availability has increased as they have become available online. A similar statement can be made for databases. While the 1995 chapter included a list of databases on plant diversity that were being developed in a variety of countries and organizations, none of them were available online at that time. Since then, the quantity and availability of databases featuring relevant data for collectors has grown considerably. The current status and availability of the key works listed by Prendergast is provided below, illustrating how availability and accessibility has changed. Reference is also made to the other lists of publications from the earlier work. The assertion made in 1995 (that contacting an expert on the flora and the area to be explored might provide quicker answers than consulting the literature) remains valid today. Although a literature search is much faster and easier today than it was in 1995, given the availability of the internet, the quantity of information available and to be screened has grown considerably, so targeted questions to experts can still save time – and experts are now much easier to find and contact through the internet. The first key works listed are the 8th edition of the Index Herbariorum (Holmgren et al. 1990) and the Plant Specialist Index (Holmgren and Holmgren 1992), as these provided not only information about herbaria, but also about experts. The number of herbaria has grown considerably since 1995 (from 2,639 to nearly 4000) and so have the staff (from 7,627 to about 10,000), according to http://sciweb.nybg.org/science2/IndexHerbariorum.asp (accessed 2 February 2011). The importance of these references has not changed, but the way of updating and presenting them to the public has kept pace with technology. There is no new hard-copy version of the Index Herbariorum but the whole Index as well as the Plant Specialist Index have been transferred to a database – “Index Herbariorum: A Global Directory of Public Herbaria and Associated Staff” – which is hosted and edited by the New York Botanical Garden and continuously updated. As the Index is fully searchable by research specialty, it also serves as a plant specialist index. The summary that Prendergast provides in 1995 about the usefulness of a search in the index and the help it can provide is still valid. Today, experts can also be identified by visiting the websites of organizations that either work in the target area on environmental, conservation and related issues or that specialize in the species that the collector is targeting. Websites focusing on specific groups of species often contain lists of experts. Some relevant examples for collectors of wild plant are mentioned here. The Crop Wild Relatives Global Portal (www.cropwildrelatives.org) provides names and contact details of experts as well as institutions working with crop wild relatives (CWR). Crops for the Future (www.cropsforthefuture.org/?page_id=514) has a database of the research interests of over 300 underutilized plant experts globally. Conservation organizations, as well, can provide the names of specialists or can be contacted to ask for specialists. The Species Survival Commission (SSC) of the International Union for Conservation of Nature (IUCN) has created targeted species list groups (www.iucn.org/about/work/programmes/species/about_ssc/specialist_groups/directory_specialist_groups/directory_sg_plants): 29 plant specialist groups exist, which cover either a country or a region (e.g., Cuba or Southern Africa) or a group of species (e.g., CWR, orchids or trees). Contact details for all specialist groups and, if existent, the respective specialist group website are currently provided on the IUCN-SSC web page. One group that is relevant to collectors of wild plants is the Crop Wild Relative Specialist Group (www.cwrsg.org/index.asp). Prendergast cites the Index Kewensis as an authoritative resource for checking the taxonomy of species (collectors should be aware of the description of new species or changes in names of species). The importance of the Index has not changed; rather, its usefulness has increased, building on progress in information technology, creating the International Plant Name Index (IPNI) (www.ipni.org/index.html) by combining the Index Kewensis with the Gray Index (originally the Gray Herbarium Card Index) and the Australian Plant Names Index into the most comprehensive listing of plant names available today and searchable online. The Gray Index includes names for New World taxa published on or after January 1886 and has provided over 350,000 records to IPNI. The Australian Plant Names Index has contributed over 63,000 records, compiled since 1973 and including all scientific names used in the literature for Australian vascular plants. IPNI is a database of names and associated basic bibliographical details of seed plants, ferns and lycophytes. Its goal is to eliminate the need for repeated reference to primary sources for basic bibliographic information about plant names. Other websites where species names and synonyms can be looked up have become available, and while they often provide additional information, they usually do not provide the publication place of species names as IPNI does. Some examples are provided below. Catalogue of Life (CoL) (www.catalogueoflife.org/annual-checklist): The goal is to create a validated checklist of the entire world’s species (plants, animals, fungi and microbes) by bringing together an array of global species databases covering each of the major groups of organisms. It is jointly produced by Species2000 and the Integrated Taxonomic Information system (ITIS) of North America and is available as an annual checklist. A search in the list provides the accepted taxon name, synonyms, the classification and, if available in the source database, common names, distribution, online resources, additional data. GRIN is the Genetic Resources Information Network of the United States Department of Agriculture (USDA) (www.ars-grin.gov/cgi-bin/npgs/html/tax_search.pl?). Together with the accepted name taxonomy, it also provides synonyms, common names, distributional range, economic importance, references and links to other web resources. It covers nearly 95,000 species or infraspecies. TROPICOS (www.tropicos.org) is the online database of the Missouri Botanical Garden in the USA. All of the nomenclatural, bibliographic and specimen data accumulated in their electronic databases over the past 25 years are publicly available here. The system has over 1.2 million scientific names and 3.9 million specimen records. The African Plant Database (www.ville-ge.ch/musinfo/bd/cjb/africa/recherche.php) currently comprises 186,948 names of African plants with their nomenclatural status. The current version 1 of The Plant List (www.theplantlist.org) provides the accepted Latin name for most plant species covered, with links to all synonyms by which that species has been known. It also includes unresolved names for which the contributing data sources did not contain sufficient evidence to decide whether they were accepted names or synonyms. This resource has been developed through collaboration between the Royal Botanic Gardens, Kew, and the Missouri Botanical Garden. The International Code of Botanical Nomenclature (http://ibot.sav.sk/icbn/main.htm) is now available. The Index Nominum Genericorum (ING) (http://botany.si.edu/ing) is a compilation of generic names published for organisms covered by the International Code of Botanical Nomenclature. The Linnaean Plant Name Typification Project (www.nhm.ac.uk/research-curation/research/projects/linnaean-typification/databasehome.html) offers a database containing typification details for all Linnaean plant names. The place of publication is provided for each binomial, along with stated provenance, the type specimen (or illustration), a reference to where the type choice was published, and an indication of the current name of the taxon within which Linnaeus’ original binomial now falls (binomial and family names). “Vascular Plant Families and Genera”, compiled by R. K. Brummitt and published by the Royal Botanic Gardens, Kew, in 1992, is now available as an online database: http://data.kew.org/vpfg1992/vascplnt.html. Two reference books cited by Prendergast that still need to be consulted as books are Cronquist‟s “The Evolution and Classification of Flowering Plants” and Mabberley‟s “The Plant-book”. The Kew record of taxonomic literature, later the Kew Record (http://kbd.kew.org/kbd/searchpage.do), has also become searchable online and is no longer published as hard copy. Kew‟s bibliographic database on economic botany and plant micromorphology can be searched through the same interface. Individual countries can easily be scanned for botanical publications, which can help to identify relevant books and journal articles for specific regions. For more details about the importance and use of this resource, please refer to the 1995 edition of this chapter. There are other online sources of digitized botanical literature, such as the Biodiversity Heritage Library (BHL) (www.biodiversitylibrary.org), which is a consortium of 12 natural history and botanical libraries. And single botanic gardens and herbaria have started to provide online access to their resources. Examples are the Missouri Botanic Garden‟s Botanicus (www.botanicus.org) or the Real Jardín Botánico in Madrid, Spain (http://bibdigital.rjb.csic.es/ing/index.php). Another key publication “Plants in Danger: What Do We Know?” (Davis et al. 1986) covers all countries of the world and is now available in full text online (www.archive.org/stream/plantsindangerwh86davi/plantsindangerwh86davi_djvu.txt). An updated edition of Frodin‟s “Guide to Standard Floras of the World”, which is mentioned in the 1995 edition of the Technical Guidelines as an indispensable source, was published in June 2001 and is available online (http://assets.cambridge.org/97805217/90772/sample/9780521790772ws.pdf). It is considered the standard listing of known Floras and ongoing Flora projects, with an annotated, geographical, systematic bibliography of the principal Floras, as well as enumerations, checklists and chronological atlases of different areas. The number of Floras available online is increasing, and they are often more than a simple checklist and include identification keys. Many Floras, catalogues and checklists of plant species are based on a geographic region or a species group (mostly family). However, they provide varying levels of detail, from simply the nomenclature, through nomenclature and distribution to the detailed description usually contained in a Flora. Photo guides to plants are also becoming available online, such as the photo guide to West African plants (www.westafricanplants.senckenberg.de/root/index.php). The TROPICOS database provides a series of 28 projects (www.tropicos.org/ProjectList.aspx) where links are provided to single online checklists, catalogues and Floras (including keys for identification) of several plant families and countries or regions. 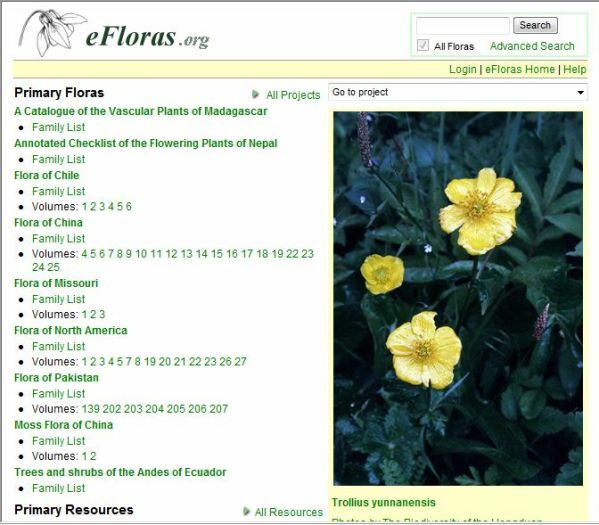 Some of them are integrated in the website of eFloras (www.eFloras.org), which provides access to 10 floras and 4 checklists (www.efloras.org). See Brach and Song (2006) for a description. Table 10.1 contains checklists and Floras for specific countries or regions, and table 10.2 lists Floras for specific groups of plants. They have either been extracted from the websites listed above or found through internet searches. The list also contains those floras listed by Prendergast that have become available online since the publication of this chapter in 1995. These lists are not intended to be complete and it is expected that more Floras will become available online in the future. The two outstanding works mentioned by Prendergast in this section in the original chapter have neither been updated nor revised, but they are still valid as references. These are Takhtajan (1986) “Floristic Regions of the World” and White (1983) “The Vegetation of Africa”. The list of the 35 floristic regions provided by Takhtajan and their subdivisions into a total of 152 floristic provinces can be viewed on Wikipedia (http://en.wikipedia.org/wiki/Phytochorion). Some of the provinces already have links to more detailed descriptions. White‟s “Vegetation of Africa” was written to accompany the UNESCO vegetation map of Africa. A very extensive checklist of online vegetation and plant distribution maps (http://cluster3.lib.berkeley.edu/EART/vegmaps.html), developed by the library of the University of California, Berkeley, can be found online. All volumes of the “Centres of Plant Diversity” have now been published, and the information for the Americas is available online (http://botany.si.edu/projects/cpd/about_project.htm). There are many different types of protected, designated and recognized areas of biodiversity, and there are many varied terms used to refer to them. The A to Z Areas of Biodiversity Importance (www.biodiversitya-z.org) provides clear, concise and relevant information about each type of area. The most comprehensive dataset on protected areas is provided through the Word Database of Protected Areas (WDPA) (www.wdpa.org). The “World Plant Conservation Bibliography”, published in 1990 by the World Conservation Monitoring Centre (WCMC) and the Royal Botanic Garden, Kew, is available online (www.archive.org/details/worldplantconser90wcmc). Many more publications have become available since the publication of that bibliography, but no similar effort has been made to compile more recent publications. Here again, a search on the internet or in targeted bibliographic databases (see chapter 13) is the best start to obtaining literature concerning conservation issues and the status of a target species or region. The threat status of a species might be verified through a search in the International Union for Conservation of Nature (IUCN) red list of threatened species (www.iucnredlist.org). Today there are global databases that provide data to help understand and map the distribution and ex situ conservation status of target species. Two examples are the Global Biodiversity Information Facility (GBIF) data portal (http://data.gbif.org/welcome.htm;jsessionid=5D1EA90E4AC94B68C5A78D24C326A35E) and GENESYS (www.genesys-pgr.org). The ecological works listed in the 1995 version of this chapter are still valid references and starting points. Additional ecological works might have become available since then and others might have been updated. The reader can easily verify this through an internet search. Online availability can also be quickly verified through a simple internet search for the title of the publication. Because bibliographies get outdated much more quickly than ecological works, a specific search will be necessary to get an overview of publications published during the past 20 years. However, the bibliographies cited in the 1995 version of this chapter provide references to important baseline publications and can serve as a way to understand how thoroughly a region has been studied. Seed identification aids are becoming available online. The first two hits when searching for seed identification are “Seed Identification and How to Identify Seeds” (www.seedimages.com/seed-identification/seed-identification.html), from Colorado State University, and the Arable Seed Identification System (ASIS) (http://asis.scri.ac.uk) developed by the Scottish Crop Research Institute. The advent of the internet has completely changed the ways and possibilities of obtaining information, and it has become the first choice for searching for information and data. The fact that many of the botanical key works have become online resources that are freely available for consultation and search confirms their continued relevance and illustrates the importance of the internet as a means to publish and search for data. The lists of online resources provided in this update are by no means comprehensive, as new resources are becoming available every day. Nearly every website has a page with relevant and related links to other websites, which can guide the user to additional resources. Brach AR, Song H. 2006. eFloras: New directions for online floras exemplified by the Flora of China Project. Taxon 55(1):188–192. Brummitt RK. 1992. Vascular Plant Families and Genera. The Royal Botanic Gardens, Kew, UK. Available online (accessed 25 September 2011): http://data.kew.org/vpfg1992/vascplnt.html. Cronquist A. 1988. The Evolution and Classification of Flowering Plants. New York Botanical Garden, New York. Davis SD, Droop SJM, Gregerson P, Henson L, Leon CJ, Villa-Lobos JL, Synge H, Zantovska JA. 1986. Plants in Danger: What Do We Know? International Union for Conservation of Nature and Natural Resources, Gland, Switzerland. Available online (accessed 26 July 2011): www.archive.org/stream/plantsindangerwh86davi/plantsindangerwh86davi_djvu.txt. Frodin DG. 2001. Standard Floras of the World. 2nd edition. Cambridge University Press, Cambridge, UK. Available online (accessed 23 May 2011): http://assets.cambridge.org/97805217/90772/sample/9780521790772ws.pdf. Holmgren PK, Holmgren NH. 1992. Plant specialists index. Regnum Vegetabile 124:1–394. Holmgren NH, Holmgren PK, Barnett LC (eds). 1990. Index Herbariorum. New York Botanical Garden, New York. Mabberley DJ. 1989. The Plant-Book: A Portable Dictionary of the Higher Plants. Cambridge University Press, Cambridge, UK. Takhtajan A. 1986. Floristic Regions of the World. (Translated by TJ Crovello). California University Press, Berkeley. White F. 1983. The Vegetation of Africa: A Descriptive Memoir to Accompany the UNESCO/AETFATIUNSO Vegetation Map of Africa. UNESCO, Paris. Genetic Resources Information Network (GRIN) of the United States Department of Agriculture (USDA): www.ars-grin.gov/cgi-bin/npgs/html/tax_search.pl?